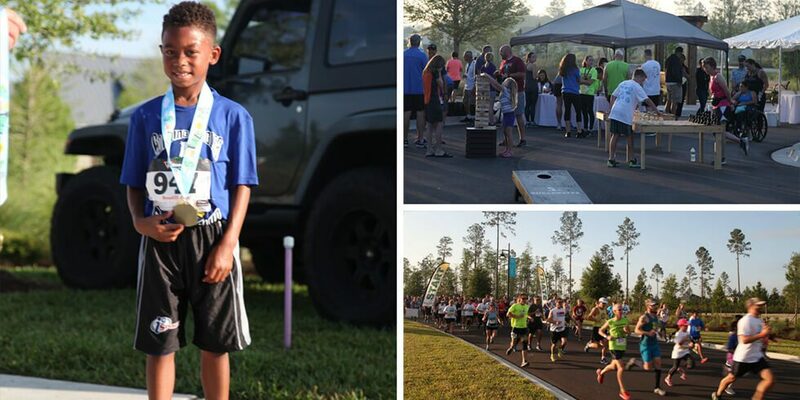 Shearwater, the new master-planned residential community on County Road 210, hosted its first “5K On the Trails and Fun Run/Walk” event on Saturday, April 22, to celebrate Earth Day and raise money for local St. Johns County schools. 166 participants ran in the 5K that took place along Shearwater’s nature trails and wide pathways that weave through preserved natural habitat. The race ended with an Earth Day celebration on the Shearwater Event Lawn. The celebration featured Earth Day kids’ crafts, various outdoor vendors, craft beer, root beer floats and tasty food trucks. Julie Stackhouse won first place after completing the 5K in an amazing 18:30:06. All proceeds from the 5K and Fun Run/Walk benefitted various wellbeing initiatives at Timberlin Creek Elementary School, Switzerland Point Middle School and Bartram Trail High School. For example, Switzerland Point Middle School is using their portion of the proceeds to help fund their “Road Raiders” running club and to help sponsor a new “Where Everyone Belongs” mentorship program between 8th and 6th graders. Learn more about Shearwater in the Kayak Club, located at 260 Shearwater Parkway, St. Augustine, FL 32092. The amenities information center is open Monday through Saturday 10am-6pm, Sunday from 12pm- 5pm. Tour model homes by David Weekley Homes, Lennar, Richmond American Homes and MasterCraft Builder Group. D.S. Ware Homes and Drees Homes have model homes available to tour in Shearwater’s new gated neighborhood, The Woodlands. Stay tuned for more information about the exciting public opening of the Woodlands, Shearwater’s new gated section, happening on May 20th. Visit Shearwaterliving.com for more information. Freehold Communities, headquartered in Boston, MA, is currently developing approximately 10,000 residential lots in Florida, Texas, Tennessee, North Carolina and California. Freehold creates Vital Communities™ that embrace healthy living, engagement, connectivity, stewardship and distinctive home design. As it evaluates opportunities, the company focuses on the right planning, the right properties, and the right partners. Beginning with comprehensive research to gain insight into the unique needs, trends and preferences in the local market, Freehold carefully considers each property to determine how to best maintain its beauty and character to create a Vital Community™, and partners with quality, creative builders who share Freehold’s philosophy of offering niche solutions and unique, timeless designs.